The marquee of the Dawn Theater. 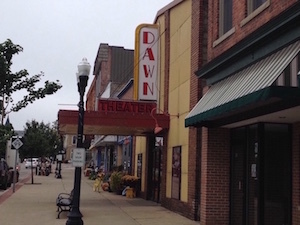 It was out with the old and in with the new at the Dawn Theater this past Sat­urday. In an effort to clear the old per­for­mance venue for its long-awaited rede­vel­opment, Hillsdale’s Tax Increment Financing Authority auc­tioned off every old item it could at the Dawn on Nov. 10. 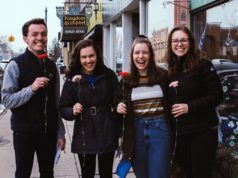 About 25 stu­dents and Hillsdale res­i­dents alike attended the event from 10 a.m. to 12 p.m., taking the chance to own a piece of the city’s past. The funds from the auction will go toward pur­chasing new audio and video equipment for the newly ren­o­vated Dawn, according to TIFA advisor Mary Wolfram. Senior Jimmy McGrath said he went out of curiosity, and ended up buying a old sign explaining that man­agement reserved the right to throw any cus­tomer out for any reason. McGrath noted that in a way, the theater is a time capsule for when it closed in 2015: A sign posted on the red-colored wall still informs vis­itors that theater staff will not serve alcohol to people born before 1994. Although he said it was fun to explore an old Hillsdale estab­lishment, McGrath also said that it is clear that the Dawn is still in its early stages of devel­opment. The building still is unheated, an expensive problem that has con­fronted TIFA since it acquired it in 2016. Brant Cohen ’18, asso­ciate at C.L. 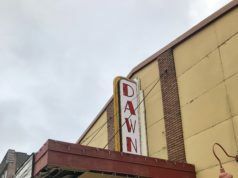 Real Estate LLC — the company charged with both ren­o­va­tions for the Keefer House and the Dawn Theater — said the auction went off well, man­aging to sell the Dawn theater’s iconic sign adorning the building’s facade. TIFA needs to remove the sign (along with the theater’s yellow overhang) to restore the building’s original street-facing windows. Cohen said that auc­tioning off these items from the Dawn marks an important first step in the restoration of the his­toric theater. 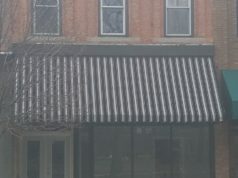 On the whole, Cohen said he hopes the new theater and the restored Keefer House will feed off each in the restoration of downtown Hillsdale. I can’t believe that place still exists! That’s so cool it’s being ren­o­vated — it will still be a cinema? I went there as a child in the 70s when vis­iting my grand­parents (I may have seen either Jaws, Star Wars, or both there) and as a Hillsdale College student in the 90s.